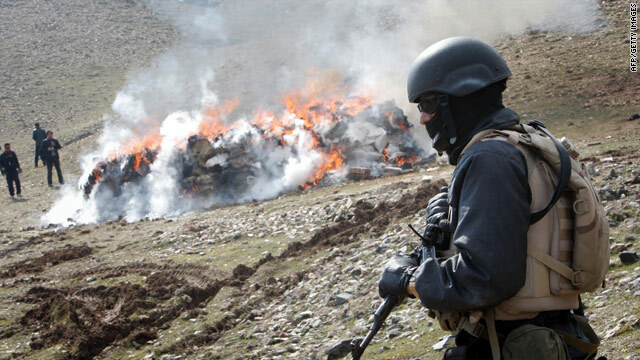 An Afghan police officer watches, as 16 tons of narcotics, including heroin and hashish, are burned outside Kabul on March 4. Official: Afghan drug problem "more complex than just the opium trade"
(CNN) -- A U.N. report says Afghanistan, the world's biggest producer of opium, is also a "major producer of cannabis" and "the world's biggest producer of hashish." The U.N. Office on Drugs and Crime issued its Afghanistan Cannabis Survey on Wednesday, documenting large-scale cannabis cultivation in half of Afghanistan's 34 provinces. "While other countries have even larger cannabis cultivation, the astonishing yield of the Afghan cannabis crop -- 145 kilograms per hectare of hashish, the resin produced from cannabis, as compared to around 40 kilograms per hectare in Morocco -- makes Afghanistan the world's biggest producer of hashish, estimated at between 1,500 and 3,500 tons a year," said Antonio Maria Costa, UNODC's executive director, in a report issued at the agency's headquarters in Vienna, Austria. The survey results reflect the significance of Afghanistan's illicit drug trade, exploited by militants to fund their operations in unstable areas, such as the country's war-torn southern region. In 2008, "a massive seizure of cannabis -- 245,000 kilograms -- was made in Kandahar near the Pakistan border." "All drugs in Afghanistan, whether opium or cannabis, are taxed by those who control the territory, providing an additional source of revenue for insurgents," Costa said. The study said the high concentration of cannabis cultivation in the south "marks a shift away from the north, which even five years ago, was the main cannabis-growing region. Illustrative of this trend is the steep increase in cannabis prices in Balkh province" because of a crackdown since 2007. The report says money "is one of the main reasons" for large-scale cannabis cultivation. "The gross income per hectare of cannabis (US $3,900) is higher than from opium (US$ 3,600). Cannabis does not need much labor cost: in Afghanistan it is three times cheaper to cultivate a hectare of cannabis than a hectare of opium. "As a result, the net income of a hectare of cannabis is US $3,341 compared to US $2,005 per hectare of opium. In the aggregate, however, because opium cultivation far exceeds cannabis cultivation, in 2009 the value of cannabis resin production in Afghanistan was estimated at between US $39-94 million, about 10-20 percent of the farmgate value of opium production." Costa said the report shows that Afghanistan's drug problem "is even more complex than just the opium trade." "Reducing Afghanistan's cannabis supply should be dealt with more seriously as part of the national drug control strategy. As with opium, the bottom line is to improve security and development in drug-producing regions in order to wean farmers off of illicit crops and into sustainable, licit livelihoods, and to deny insurgents another source of illicit income."